"We have a rule here at GT: 'If it doesn't help the customer in some way, don't do it.' It's really that simple: the customer must always come first. Always." In 1965, Gordon Pendergraft had a vision. With a penchant for customer service that never stops, Mr. Pendergraft saw an opportunity to provide customers with exceptional,industry-leading customer service and first-rate product quality at a fair price. Thus, GT Industries began its humble beginning in Wichita, KS. 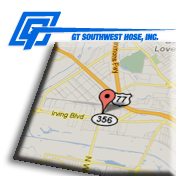 Today, GT Southwest Hose is the anchor of that vision. Serving North Texas for over thirty years, GT continues to set the standard for the level of customer service their customers expect. "If our customers don't feel it's simple and easy to work with GT, we're doing something wrong," said Mike Carothers, GT Southwest's General Manager, and a 10 year veteran in the business. "We take enormous pride in taking care of our customers. They're our lifeblood, and deserve our 'A Game,' every time." ... "GT made it EZ!" Just off 35E and centrally located, many customers choose to come in and get what they need - often on the way to the job site. Stop in and visit with our staff about your specific needs. The service (and the soda) is on us!